Bots (short for web robot) are small computer programs that can run automated tasks online, sometimes pretending to be humans but capable of performing thousands of these tasks per second and also capable of activating themselves depending on the context. Bots can be bought and used for many commercial and political purposes. Alternatively software can be downloaded that enables people to programme their own bots without programming skills. Reference: Eli Pariser. The Filter Bubble: What the Internet Is Hiding from You. New York: Penguin. 2011, p. 167. Bots can be programmed to perform tasks for users such as aggregating information or news, responding to inquiries or questions, organising meetings, sending emails, monitor online forms, mining data, ordering food, booking flights or checking news (see Uses). Reference: Emilio Ferrara, et al. ‘The Rise of Social Bots.' Communications of the ACM 59 (7), 2016. A second category of social bots includes malicious entities designed specifically with the purpose to harm. These bots mislead, exploit, and manipulate social media discourse with rumors, spam, malware, misinformation, slander, or even just noise. To acquire visibility, they can infiltrate popular discussions, generating topically appropriate—and even potentially interesting— content, by identifying relevant keywords and searching online for information fitting that conversation. After the appropriate content is identified, the bots can automatically produce responses through natural language algorithms, possibly including references to media or links pointing to external resources. Reference: Emilio Ferrara, Onur Varol, Clayton Davis, Filippo Menczer and Alessandro Flammini. 2016. ‘The Rise of Social Bots.' Communications of the ACM 59(7), 2016. pp.96-104. 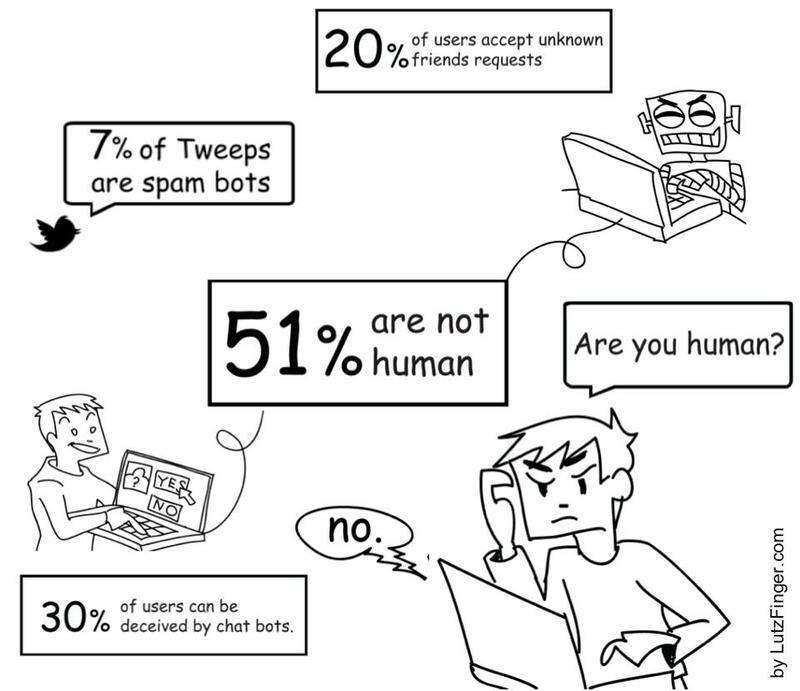 Bots used on social media to generate tweets, and be followers or gather followers on platforms such as Facebook can be referred to as social bots or socbots. They aim to sell products, promote ideas, spread political messages, or otherwise manipulate public opinion. Or they can delay public policy reforms by giving the impression of 'grassroots' opposition to it. Reference: Carl De Lucia. ‘The Rise of Social Bots.' Social Media Today, 27 August 2013. The social bots you see on Twitter for example have built in databases of current events and can recognize language. They then use that language to form sentences that are relevant to current topics. And, they sleep at night. 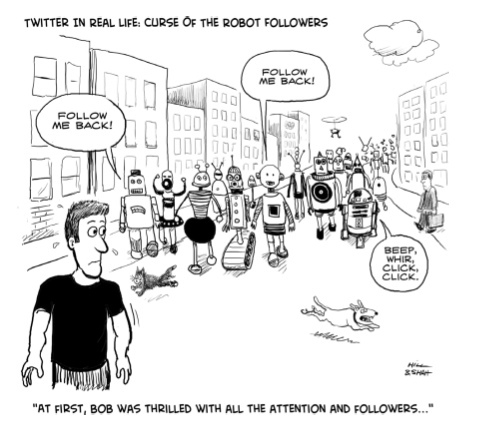 That's right, these bots are programmed to turn off and turn on at certain hours, so they appear more realistic… Some observers estimate that about 50% of the average Twitter users’ followers are actually bots.